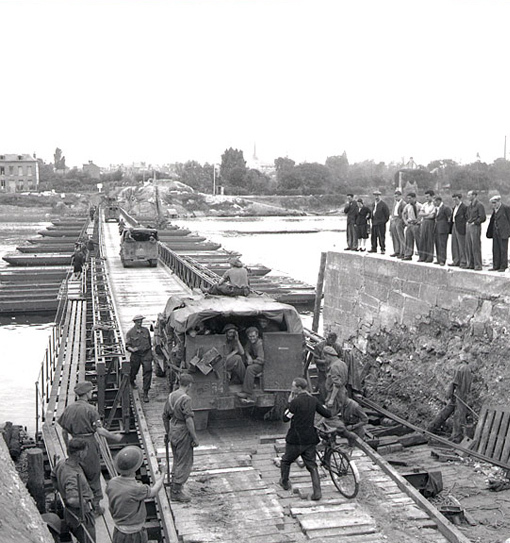 Vehicles of the 4th Canadian Armoured Division crossing pontoon bridge over the Seine River near Elbeuf, France, August 28th, 1944. Photo by Ken Bell. Department of National Defence / National Archives of Canada, PA-113662. In order to progress eastwards through Europe, the Allies had to ensure a safe supply route. This meant seizing as soon as possible the seaports along the Channel so they may ship in the equipment, vehicles and supplies the men and the war machine demanded in enormous quantities. Once the Falaise Gap was closed, General Harry Crerar received the order to move speedily towards the Seine and capture Le Havre. To the north, under command of the First Canadian Army, I British Corps was marching along the coast to Honfleur. On its flank, II Canadian Corps was headed for Rouen. On August 26th and 27th, after cleaning up a pocket of fierce resistance in the forest of the Londe, the 3rd and 4th Canadian Divisions crossed the Seine near Elbeuf and reached Rouen on the 30th. 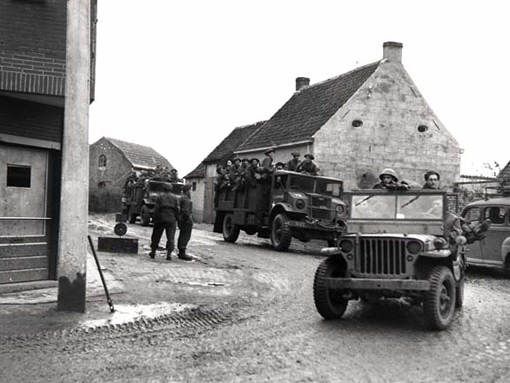 In early September, II Canadian Corps was moving speedily through northern France. On September 1st, it was in Dieppe, where hundreds of Canadians had been killed two years earlier. Le Tréport was liberated the same day and the troops crossed the Somme River on September 3rd. The French population, in cities and throughout the countryside, greeted them with noisy enthusiasm. – Letter of a Canadian officer to his family, September 2nd, 1944. Convoys of 2nd Canadian Infantry Division speed through Rouen, France, August 31st, 1944. Photo by Harold G. Aikman. Department of National Defence / National Archives of Canada, PA-131346. 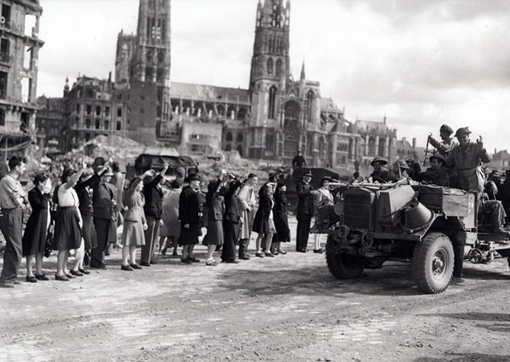 The Canadians were not aware that on September 4th, Hitler had ordered to shore up the defences of Calais, Boulogne, Dunkirk and the Island of Walcheren, as he viewed Allied presence in those cities as a major threat to Germany. As a result, he was ready to keep them under control at all costs. In Boulogne, as early as September 5th, the 3rd Canadian Infantry Division faced a resolute garrison; the Canadians launched their attack on the port city on the 17th after days of intensive air raids. Battle raged for six days until the remaining German soldiers surrendered on September 22nd. Some 9,517 prisoners were made. During their four-year occupation of Calais, the Germans had built solid defences along the coast but did not consider the possibility of a terrestrial attack. 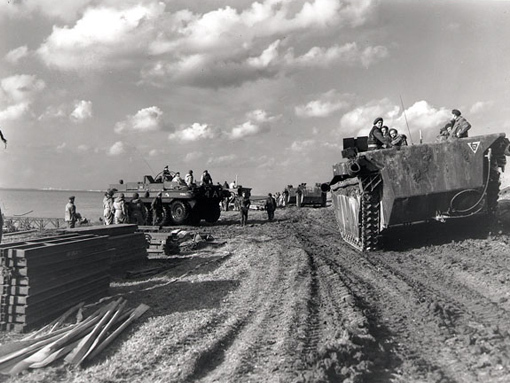 The city was therefore vulnerable on the inland side and the 3rd Canadian Division approached it from that direction. After eight days, from September 25th to October 1st, 1944, the Canadians finally overwhelmed the garrison of 7,500 who defended the town. Between Boulogne and Calais, the batteries on Cape Gris-Nez represented a serious threat to navigation with their big-calibre guns that could fire shells over a considerable distance; they could even hit the British coast. The 9th Infantry Brigade attacked the position and silenced the guns on September 29th. In September, while they were cleaning up the coast, Canadian units came across and destroyed several V-1 flying bomb bases. They were glad to eliminate that scourge which had been such a threat to Londoners, with whom over years of training and waiting in English bases, they had built many ties of friendship. In early October 1944, the Allies controlled the harbours north of the Seine but the supply issue was not yet solved: Dieppe, Le Tréport and Ostende had been opened but could not handle the high volumes that Allied troops in Europe required. Le Havre, Boulogne and Calais were not serviceable having suffered major destructions. Further north, Antwerp had been liberated by the Allies on September 3rd, but the city was located on the Scheldt River, some 80 kilometres from the open sea and the river’s mouth was still under German control. The only way to make sure that the supplies required by the campaign in Europe could enter the continent was to capture the Scheldt. This was to be the mission of the First Canadian Army. Corporal S. Kormendy covers Sergeant H.A. 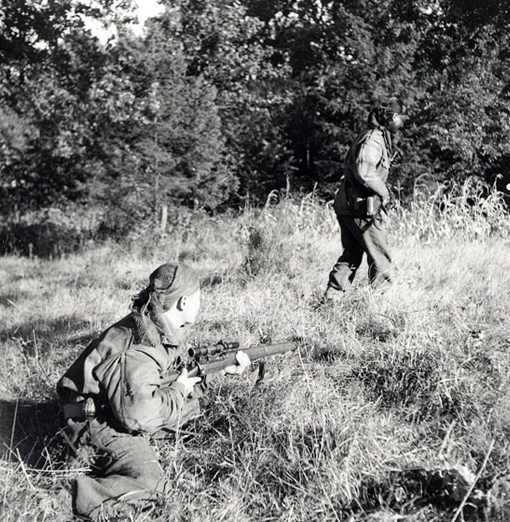 Marshall, a scout of the Calgary Highlanders, as he moves over open ground near Kapellen, Belgium, October 6th, 1944. Photo by Ken Bell. Department of National Defence / National Archives of Canada, PA-131245. The Scheldt flows to sea by a very wide mouth divided in two by a long peninsula made of three separate islands, South Beveland, North Beveland and Walcheren. Located in the Belgian-Dutch border area, this is a region of polders, low-lying fields conquered over the sea and bordered by a network of dykes and canals. The roads are built on top of the four- or five-metre high dykes. In this totally flat and wet countryside, no one can move without being spotted. This was where the First Canadian Army had to fight and dislodge the German defences, which knew nothing should be spared to protect the access to Antwerp. Walcheren Island to the north and Breskens to the south were the two most solid positions. Lieutenant-General Guy Simonds commanded the attack of the First Canadian Army against the Scheldt, in replacement of General Harry Crerar who was recovering from a bout of dysentery. Before giving the signal for the assault by ground troops, he ordered aerial bombings to destroy the dykes and flood Walcheren and some of the lowlands south of the river’s mouth. On October 2nd, 1944, the 2nd Canadian Infantry Division marched north from Antwerp towards the entrance to South Beveland it had to capture, and then onwards along the isthmus. The division met with unbreakable resistance near Woensdrecht and Hoogerheide. On September 8th, German troops packed beyond Korteven launched fierce counter-offensives. Woensdrecht, a strategic point since it was the key to the peninsula, remained in German hands. Bloody fighting went on until October 16th, as Canadian and German soldiers fought for the access route to the peninsula. On October 13th, the “Black Friday”, the Black Watch regiment was decimated for a second time within four months, losing 145 men and all its commanders in an especially violent and merciless engagement. On October 16th, the Royal Hamilton Light Infantry, supported by the 10th Armoured regiment and the whole artillery of the division, fought its way up to the village of Woensdrecht and held the mound that overlooks it. Thus they were able to drive back counter-attacks and retain the position, again at the cost of many lives. A column of Alligators passing Terrepin amphibious vehicles on the Scheldt River near Terneuzen, October 13th,1944. Photo by Donald I. Grant. Department of National Defence / National Archives of Canada, PA-114754. Meanwhile, the 3rd Division attacked an enemy pocket that remained near Breskens. The crossing of the Leopold Canal in the night of October 6th to 7th proved a difficult task. Once they reached the side under enemy control, soldiers set up bridgeheads hardly deeper than the canal’s shores; the ground was soaking wet and trenches filled up with water as soon as they were dug. The whole area was under enemy fire including shells from big-calibre coastal defence guns more than 15 kilometres away. Wounded men filled the field care station. In spite of all this, the 7th Brigade solidified its bridgehead and moved on. The 7th Brigade is moving through a village in the vicinity of Leopold canal, October 18th, 1944. Photo by Donald I. Grant. Department of National Defence / National Archives of Canada, PA-137188. Woensdrecht captured, the 2nd Division undertook to clean up South Beveland. On October 24th, its units entered the isthmus linking the island with the mainland. 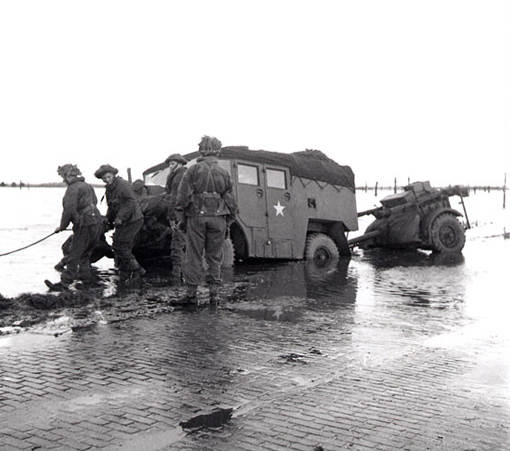 Two days later, more troops crossed the Scheldt in amphibious Buffaloes and landing crafts. In South Beveland Canadian and British soldiers were able to move forward without meeting any serious opposition as the Germans were by then trying to leave the island. On November 2nd, both South and North Beveland were liberated. The enemy’s last post was Walcheren Island, a real stronghold whose beaches were filled with heavy artillery batteries. There was only one road access, the Walcheren causeway, a straight road, some 40-metres wide and 12-kilometres long. The causeway carried the main road as well as a railway line with only one track left. On both sides only wide expanses of muddy marshes dotted with reeds. The road afforded no protection whatsoever. Of Walcheren Island proper, only remained the peripheral heights, the centre being completely flooded. The battle for the causeway started on October 31st. The Black Watch, the Calgary Highlanders and the Régiment de Maisonneuve followed one another. A narrow bridgehead was finally set up in the morning of November 2nd and the Régiment de Maisonneuve held on to it desperately for several hours until relieved. The Régiment de Maisonneuve and the 5th Field Regiment, Royal Canadian Artillery, were the last Canadian units to take part in the Battle of the Scheldt. British units relieved the Canadians; exhausted troops were pulled back from the battlefield to a rest area. A gun-tractor skidded off the road on the flooded island of Beveland, October 28th, 1944. Photo by Ken Bell. Department of National Defence / National Archives of Canada, PA-131257. On November 1st, amphibious assaults were made on Westkapelle, Flessingue and the last pockets of German resistance fell on November 7th after some violent fighting. Walcheren Island was finally captured and, once the river mouth was cleared of mines, the Scheldt was opened to shipping. On November 28th, 1944, Antwerp harbour received the first supply shipment. Canadians were not present at the opening ceremony but the first ship of the convoy was a Canadian one, Canadian-made and bearing the historical name Fort Cataraqui.